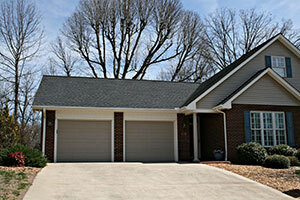 Getting your garage door insulated serves as a huge benefit. For the most part, doing so will lower your energy cost and keep unwanted outdoor temperature where it belongs, outside. In addition, insulation will block-out exterior noise significantly. If your door isn’t insulated you can definitely do it yourself. There are basic things to know that will help this project be a successful one. If you are planning to fill your door with insulation, the first thing to know is how to take the proper measurements. Measure the dimensions of your door panels. These are the rectangular sections that are linked by hinges and attached to the garage door frame as a single flexible piece. The insulation will be placed inside of the garage door behind the panels, therefore these measurements will determine the amount of insulation that you will need to purchase. Now that you have taken the measurements, now it’s time to actually go out and buy the garage door insulation. There are basically two kinds of insulations that are suitable for garage doors. The first kind is polyethylene foam that is placed inside of reflective-type aluminum. This type comes in rolls that are quite flexible. The second kind is polystyrene foam which comes in rigid sheets. This type is more effective than polyethylene insulation; however, because it is rigid, it is known to be a bit tougher to work with. Whichever insulation you choose, make sure it has a sufficient R-value rating. Avoid insulation that is spray-in or fiberglass because these are not appropriate for overhead garage doors. Once you have the garage door insulation that you want, get yourself a measuring tape and measure a single panel. Use a pen to make the markings of the measurements. Then take a utility knife to cut out the needed size. When cutting, lean more toward the notion that more is better than less. Fit the cut insulation against the panel then tuck it inside of the metal frame. After you’re all done, use foil-type tape to strap the insulation to the door.